Firecakes. I kept walking past the words painted on a glass storefront window, and I liked the design - it was friendly, cute, a little modern, a little retro. Intriguing. Eventually I saw a flurry of activity: bakers, cleaners, various workers. Then one morning, word went around the office I was working in for the week: Free doughnuts! In truth, I'm not a doughnut person. So I reacted accordingly - I stayed at my desk while half the office cleared out. Then, as people trickled back in, I heard the magic words: Valrhona chocolate doughnuts. Wait, what? A colleague showed me photos on her smartphone - and they looked good. And confirmed that yes, Valrhona chocolate doughnuts were available. Within minutes I was inside Firecakes for a pre-opening preview of gourmet treats in flavors like butterscotch praline, coconut cream, apple fritter, and triple Valrhona chocolate cake. I was not disappointed. The doughnut, crafted in small batches from a family recipe, was delicious - crisp on the outside, warm and soft on the inside. The glaze wasn't cloying, as is so often the case. Quality. The friendly staff also gave me a latte (La Colombe beans - can't argue with that) that paired perfectly with my pastry. 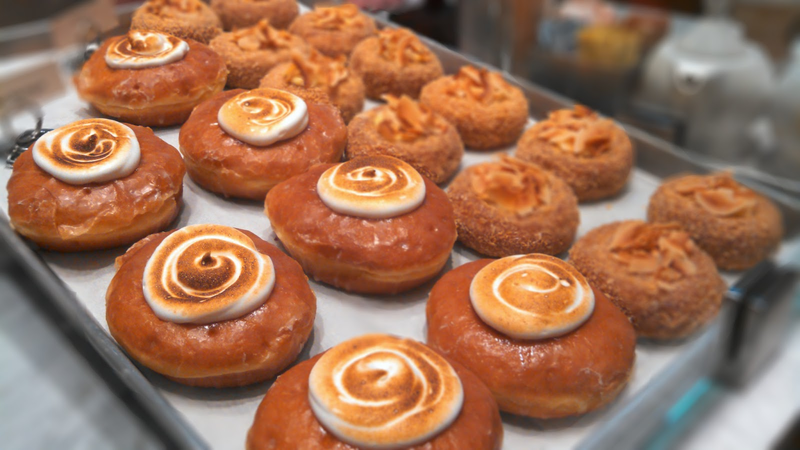 Now that Firecakes is officially open, you, too can experience one of the better doughnuts you'll find in Chicago. If you're already a fan of fried dough to begin with (and I know most of you are! ), you may need to visit on a regular basis. Hey Dawn! Thanks for checking out my review Firecakes. The Valrhona glazed yeast doughnut is just as good!